Don't get angry about the small stuff. And realize most of it is small stuff. In general, Matt wakes up earlier than I do each morning. This morning, I heard him in the kitchen, putting away the dishes (how sweet is that?). Even though we try to divide our chores evenly, we still occasionally do the other person's chores for them. Then I heard a dainty dish break. And I thought, "Oh no. It's our china! We've only had my grandmother's china for a month and we've already broken a dish! She had that for more than 40 years and she only broke one obscure piece!" We used our china for the Retro Prom on Saturday night, as well as the Time Bank orientation on Sunday, so it was all over our kitchen. 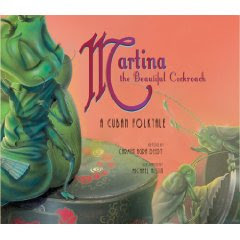 And then I remembered a story I read during tutoring yesterday (on Mondays and Wednesdays I tutor three 5th graders in reading for an hour): Martina the Beautiful Cockroach. When Martina is 21 days old, it is time for her to marry. Her grandmother pulls her aside and teaches her how to use the "coffee test" to discern whether or not someone is a worthwhile suitor. When a suitor arrives, Martina offers him coffee. As she serves it, she intentionally spills it on his shoes to test his temper. The angrier he reacts, the more ill-suited he is to be a good husband. I won't spoil the good ending for you! As I lay in bed, I forced myself to acknowledge that china is china. It's just a dish. I reminded myself that Matt didn't break it on purpose. He was actually being incredibly generous with his time by doing one of my chores! I reminded myself that at least we were actually using our china. It's better to use it and accidentally break it than to leave it in the cupboard perfectly preserved. I reminded myself that a broken dish (even an heirloom) is insignificant in the grand scheme of the world's problems. I resolved not to get angry. What a great post Sara. It reminds me of when Luke broke my piggy bank ( my grandfather bought it for me when I was 5, it was one of the last gifts from him before he died) unfortunately I didn't control my temper so well, there was def crying involved. Luke did glue it back together, missing pieces and all. I wish I had reacted a little better when it happened though. I think you make a great point here. My fiance moved to Chicago over a year ago, and since then we've really been able to prioritize what we get mad over - and why. You learn that the time you have with someone is precious whether you live with them or a thousand miles away. I can't wait to read that book, I think my daughter would like it was well. Fantastic post Sara! Great reminder that in the grand scheme of things most arguments are over things that don't really matter. I love this. I try to ask myself, "will you be glad you picked this fight tomorrow?" before reacting out of anger. nice post! i usually try to ask my self in a lot of situations (fights, sadness, agravation) if my problem is really going to matter next week, next month, 20 yrs from now. The answer is always "no," and i am able to stay more grounded that way. sara, i love this post. it's a reminder that we really do have choices: we can choose how to react to a situation, or we can choose not to react to a situation. i love your words of wisdom! lol, that's awesome--- and a good reality check for us women!! Things like this is something I'll have to work on when I get married-- not to freak out about little foxes here or there and remember what's really important! What a great post. It seems like compassion is easily replaced with frustration once you're married, and you're right that it's so important to stop and check yourself when you find yourself having one of those knee-jerk reactions. Thanks for the reminder! Great post! Your thoughts are a lot better than mine when I'm in bed... mine go something like "WHY AM I AWAKE BLURGH"
great post! i really appreciate the sane, groundedness of your blog. also, i LOVE Martina the Beautiful Cockroach.